The all-electric car has been an exclusive commodity, reserved for the select few who could afford to spend as much on a car, as they could on their mortgage. Thanks to Chevrolet, that is all changing. The 2017 Bolt has only been delivered to select regions in the United States thus far, but it has spurred an all-electric revolution that is turning the automotive world upside down. Not only can drivers save money at the pump, but – as a nation – we are moving away from our dependency on foreign oil, and are leaning on our own innovative minds to get us from A to B. The Chevrolet Bolt will be arriving at Albany car dealerships before we know it, so it is important to brush up on some all-electric etiquette you may not even know you needed to learn. Whether you graduated from college last May, or it’s been decades since you graced your old college room with your presence – there is a good chance you remember what it’s like to do laundry in a public dorm. For those of you who are apartment dwellers, we feel your laundry-completing pain, but college kids arguably have it worse. From drunk party-goers stealing your intimates straight out of the wash cycle, to inconsiderate (and impatient) co-eds taking your machine before your clothes are fully dry – the college laundry scene is like a spectacle straight out of The Three Stooges. Everyone is well aware of proper communal laundry etiquette, but that doesn’t not stop them from stealing machines, undies, and your chance at wearing a fully dry pair of jeans to your 8 AM final. Yes, college. Where all of the millennial minds gather under one proverbial roof, and their entitled attitudes flow into every aspect of college life, including the wash and dry cycle. If you were a frequent victim of the college laundry room klepto, or you were guilty of these wild improprieties – now is your chance to change things around. The all-electric car market is taking a turn towards accessibility, and much like the shared laundry room in your college dorm, there is a certain set of etiquette that must be followed in order to keep the peace. As more and more all-electric cars are added to the roadways of America, it is important to realize that they not only operate differently, but also “fuel” differently. Obviously, you won’t be pulling up to the pump in your new Chevy Bolt EV, but you will need to get your compact car charged up at some point in time, and that includes out in public. Unless you are the Type A person who can perfectly execute your daily commute so that you will only need to charge your Bolt at home in your garage, you will need to find ways to keep yourself powered-up on the go. Taking the time to familiarize yourself with proper EV etiquette can help keep you in good standing within the all-electric community, and reverse your past communal-living gaffes. Before you take to the town in your all-electric car, check out some of these unspoken rules that you are expected to obey. Don’t Park There Unless You are Actively Charging: There is nothing worse than realizing you are about to run out of power on your electric car. Perhaps even more upsetting, is that once you finally locate a charging station, it is home to a parked car that isn’t being charged. Just the thought makes you want to let out a throaty “grrrr.” Unlike an idle washing machine in college, you can’t move someone else’s electric car out of the way so yours can charge. On the opposite side of the equation, if you are driving a gasoline car, you should never park in a EV charging station spot. If you do park in an EV charging spot with an Internal Combustion Engine car, you are actively ICEing a driver who may need it – and that just isn’t cool. Not only will you be labeled by your gasoline-free peers, you will likely get a hefty fine in the form of a ticket to go along with your newly acquired jerk-status. Bottom line: Don’t be that guy. 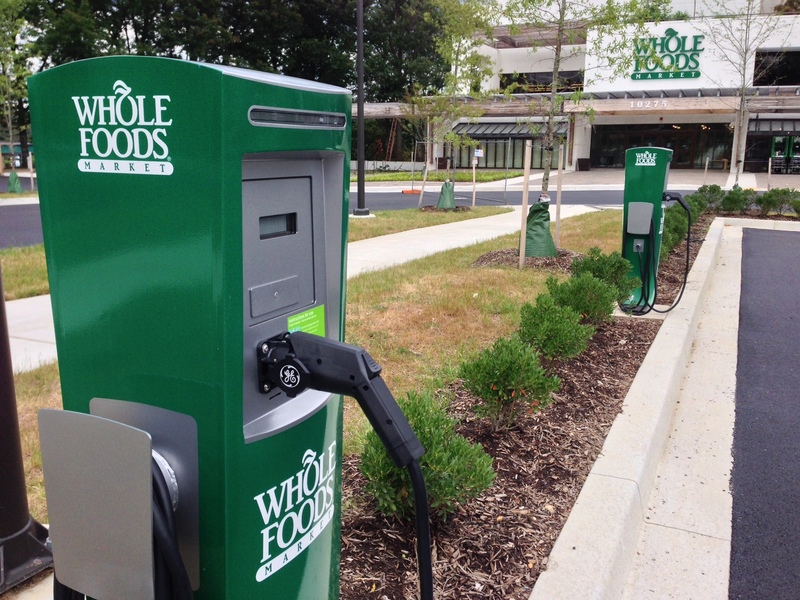 Those charging stations aren’t there for you to snag a closer parking spot. People rely on them to get home, get to work, and complete their trips successfully – so let them. LNT – Leave No Trace: For all of you trail hikers and national park enthusiasts, you are familiar with the Leave No Trace mantra. When you head home for the day, leave nothing behind to make it look like you were even on the trail. Likewise, when you leave your dedicated charging station, take a minute to hang the cord back up (nicely), and check your surroundings for any other items that you may have left behind. Leave no trace, not only for the sanity of the next charging station user, but also for your own safety. Nothing good can come from high-voltage power cords repeatedly run over by heavy cars, which can even lead to electrocution after long-term abuse. Bottom line: put the cords back where you found them, and leave the area nicer than you found it. Don’t Unplug Someone’s Car: The people who think that unplugging someone else’s car is okay, are the same people who took your damp clothes out of the dryer because they felt their clothes were more important. If you need to charge your car, the rule of thumb is that you should never unplug someone else’s car from the charging port. Unlike the dinosaur laundry machines in college, most electric cars will notify their owners when they are unplugged, via a smartphone app. Avoid an awkward encounter altogether by waiting your turn. You perfected (or should have) this skill in preschool, now use it. Leave a Note: A little courtesy can go a long, long way in the EV community. If you live in an area that does not offer a ton of charging stations, consider leaving a note on your car before stepping away. Some drivers will simply jot down a quick sentiment telling other EV owners that they can unplug their vehicle once the light turns green, or leave a number so that they can move their vehicle out of the way if there isn’t room enough for two cars by the charging station. When you own and operate an all-electric car, you become a part of a community within a community. Chances are, you will get to know other EV drivers in your town, and will learn their charging schedules. Take advantage of this community asset, rather than burning bridges with improper EV etiquette. To find out how soon you can purchase the new 2017 Chevy Bolt here in Albany, come down to DePaula Chevrolet and speak with our knowledgeable team. The newest and most affordable all-electric car will be here before you know it – so don’t miss out.